A fixture of elegance on Manhattan's Upper East Side. A fixture of elegance on Manhattan's Upper East Side, Cornelia Spa at The Surrey has created an intimate oasis of urban serenity. Dedicated to this philosophy is a spa staff committed to uncompromising excellence, gracious service, and providing unique, luxurious experiences. Well-appointed treatment rooms allow the utmost in privacy, and inspired spa rituals are orchestrated to meet guests’ individual needs. The New York spa, with its citrus, sandalwood, and musk aromas, hand-blended teas, and devotion to personalized renewal, is a timeless fusion of intimacy and classic sophistication, cornerstones of both Cornelia and The Surrey. In addition, features at The Surrey, New York City's only Relais & Chateaux hotel, include a Private Roof Garden, tasteful accommodations, and a stylish French restaurant and lounge. Upscale shopping, dining, and museums are a short stroll away. The 2,500-square-foot Cornelia Spa at The Surrey, occupying the hotel's second floor, is designed to offer every guest a personalized experience. The spa's intimate ambience is enhanced by five treatment rooms, each appointed with its own shower facility, and guests do not need to leave the privacy of their own room for changing. Chic spa interiors feature soothing hues, offset by vibrant art deco influences and hints of Cornelia's signature orange. Guests of The Surrey are within a short stroll from many of Manhattan's much adored cultural and entertainment destinations. The hotel is a mere block from Central Park, offering nearly 900 acres of verdant parkland, sculptures, and tranquil ponds, along with family-friendly attractions like the ice skating rink, Belvedere Castle, carousel, marionette theater, and Central Park Zoo, which draws nearly 25 million visitors annually. During the summer, the Delacorte Theater hosts the New York Shakespeare Festival, and the New York Philharmonic and Metropolitan Opera provide open-air concerts on Central Park's Great Lawn; in November, runners race the last miles of the New York City Marathon across the park's south side to an audience of thousands. Art enthusiasts will enjoy exhibits and galleries at the eminent Metropolitan Museum of Art, the Guggenheim Museum, and the Whitney Museum of American Art, all within walking distance of the Surrey. Shoppers are steps from browsing the luxury boutiques of Madison and Fifth avenues, and to the southwest is Times Square's theater district. Sleekly designed salons and suites feature handsome furnishings such as hand-painted wardrobes and stylish desks with built-in vanities, and high-tech touches include electronic safes, 37-inch LCD TVs, and Denon iPod docks. 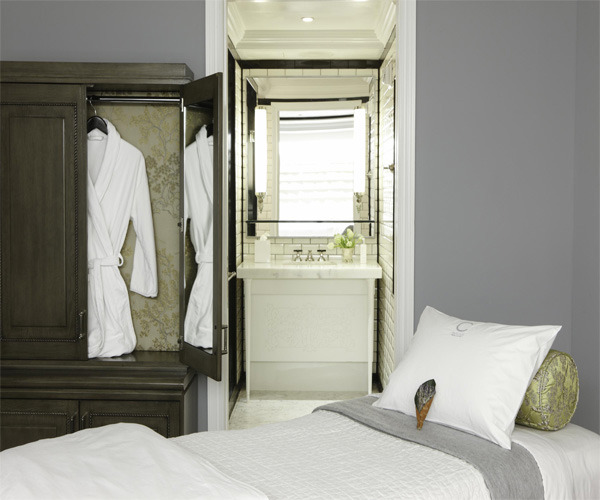 Pratesi robes, Laura Tonatto products, and glass-encased showers can be found in the bathrooms. Guests slumber on Duxiana beds with customized Sferra bedding and a selection from the hotel's pillow menu. Select accommodations come appointed with fireplaces, soaking tubs, kitchen and dining areas, and balconies. The Penthouse Suite, with its wraparound terrace, offers unparalleled views of Central Park and access to the Surrey's Private Roof Garden, while elegant interiors of the Presidential Suite include a marble fireplace and baby grand piano. Classic French fare is showcased at the hotel's Michelin star award-winning Café Boulud, where guests can enjoy sumptuous dishes showcasing seasonal and international flavors, ingredients, and produce. Open for breakfast, lunch, dinner, and Sunday brunch, the eatery is a fashionable spot for hotel guests as well as locals. 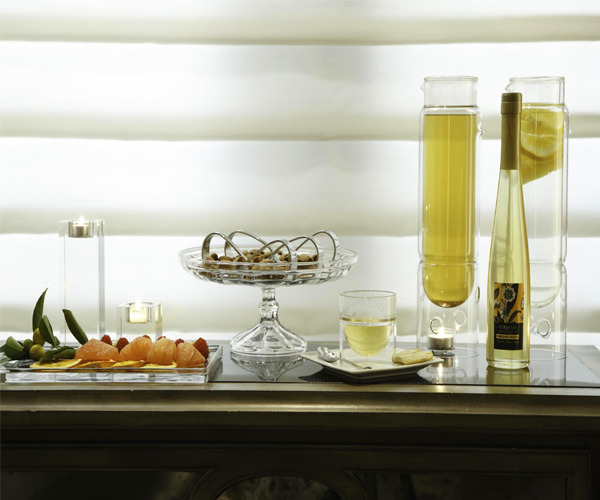 Bar Pleiades invites guests for an aperitif or after-dinner drink in a Coco Chanel-influenced lounge with black-and-white accents, French doors, and banquette seating.